Split Pea Soup with Ham is a hearty and comforting soup comprised of split peas simmering in a flavorful broth. 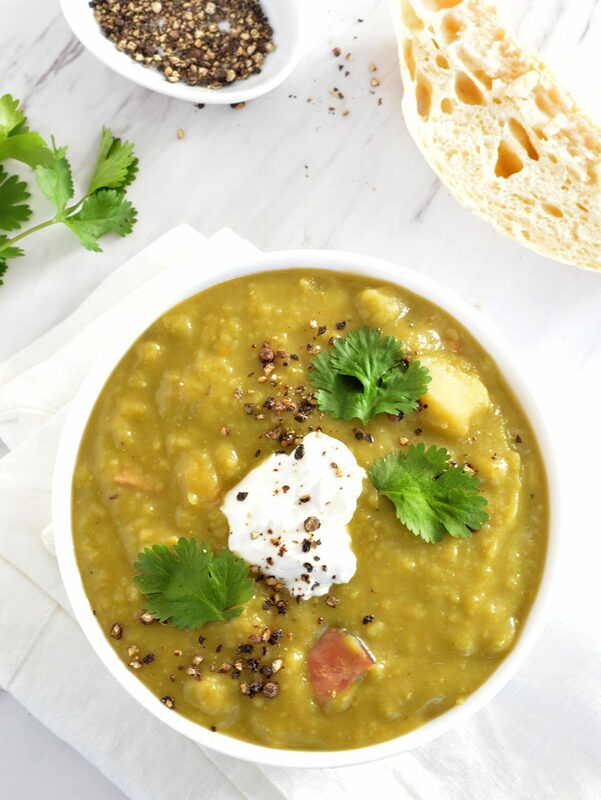 This Split Pea Soup can be made in the Slow Cooker, Instant Pot or Stovetop. Split Pea Soup is one of the easiest soup recipes to make. It’s pretty hands off no matter the method you utilize to cook. In addition, it’s pretty adaptable for various lifestyles out there, including vegan and vegetarian. 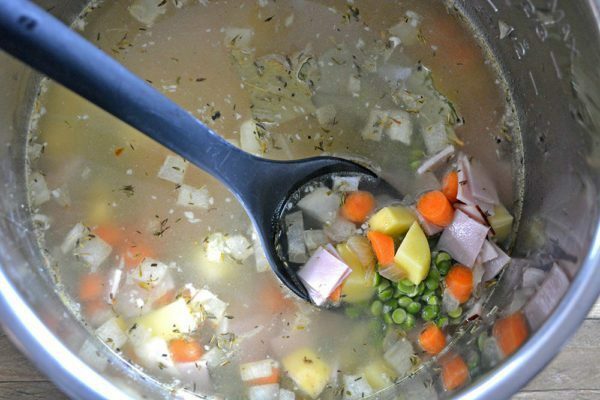 This is the perfect soup recipe to use up your leftover Easter or Christmas Ham. The elements of this split pea soup combine to produce a silky and smoky flavor unsurpassed by store bought brands. The split peas add the starchiness and thickness while the sweet carrots and salty ham balance out the earthy flavor of the peas. 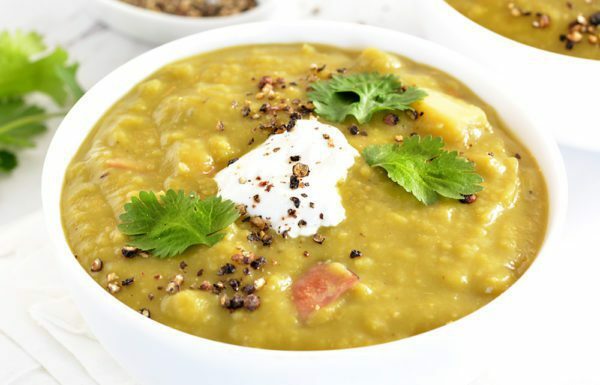 Included below are instructions for Slow Cooker Split Pea Soup, Instant Pot Split Pea Soup and Stovetop Split Pea Soup. 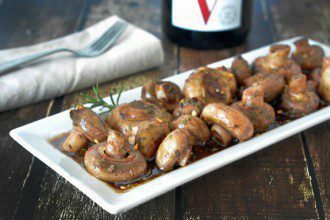 For this recipe, we used the popular Instant Pot Duo Plus, which has a 6 qt capacity. 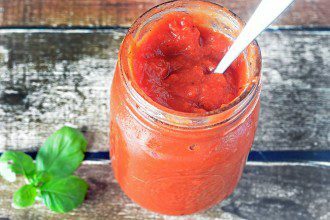 We’ve posted quite a few Instant Pot recipes, so make sure to check them out. The split peas need to be rinsed and picked through to remove any stones that may be mixed into the bag. DO NOT skip this step. Who wants a trip to the Dentist for a broken tooth? To reduce carbs, feel free to omit the potatoes. No replacement is needed. The thickness of the soup is adjustable to your personal preference, hence the range in the amount of broth needed. Start with the lowest called for amount and add to the end product as you see fit. Split peas continue to thicken as it stands, so the longer it cooks the thicker it will be. With the exception of the butter and olive oil, the ingredients for the slow Cooker Split Pea Soup, Instant Pot Split Pea Soup and Stovetop Split Pea Soup version stay the same. 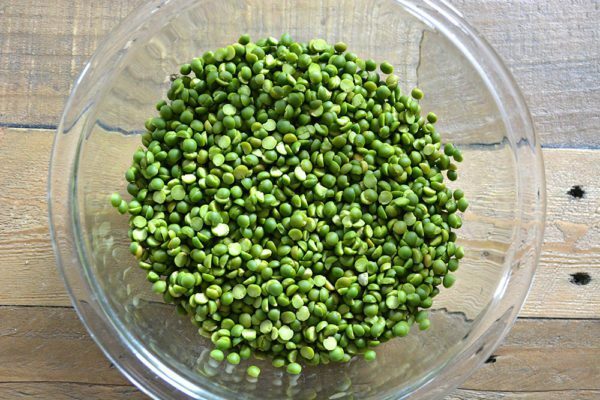 Do Split Peas Need To Be Soaked? It depends on the manner in which you cook the split peas. Neither the Slow Cooker Split Pea Soup or Instant Pot Split Pea Soup versions need to be soaked. This Stovetop Split Pea soup recipe does not require soaking as they are simmering in the broth for close to two hours. Most split pea recipes, with cook times under 2 hours, tend to need pre-soaked beans. What Are The Ingredients For Split Pea Soup? Besides split peas and the optional ham, the ingredients for Split Pea Soup are mainly healthy vegetables: chicken broth, onion, celery, carrots, garlic, bay leaf, thyme, black pepper, salt. While many use ham bone in their Split Pea Soup, I tend to use leftover deli ham since that’s usually what I have on hand. You could also use smoked ham shanks or ham hocks. It’s such a flavorful soup recipe, you can’t go wrong with any versions of ham, really. Is Split Pea Soup Vegan/Vegetarian? It sure can be. Just utilize vegetable stock in place of the chicken broth, omit the ham and use equal parts olive oil in place of the butter. Is this Split Pea Soup Recipe Dairy Free? Not as written. 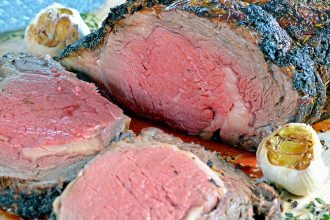 Just replace the butter with olive oil and you’re good to go. Oh – and leave out the dollop of sour cream as well. Can You Freeze Split Pea Soup? Split pea soup can be made in advance and stored in the refrigerator for 3 days or in the freezer for up to 3 months. 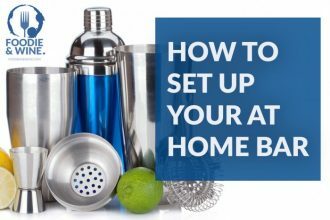 Make sure the soup is completely cooled and tightly covered. It will thicken so be prepared to add a little chicken broth or water to thin out a bit when reheating. Turn the pressure cooker on and press the Sauté button. Add the olive oil and butter once the screen says "hot". 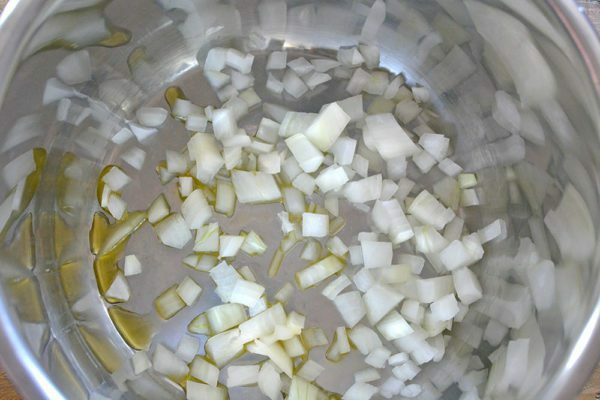 Add the onion, potatoes, celery, bay leaves, and thyme and stir occasionally until the onions are slightly translucent. Stir in the carrots, garlic, ham and pepper. Cook for about a minute. Add 5 cups of broth and bring to a simmer (You'll add the extra broth later if you like a thinner consistency). Stir in the rinsed split pea. Put the lid on the pot and lock. Make sure the steam release valve is in the sealed position. Press the cancel button. Press the Pressure Cook button and set to 20 minutes, high pressure. After cooking, let the soup NPR for 10 minutes before releasing the steam valve and removing the lid. Discard the bay leaves and any ham bones if you used them. Coarsely mash soup to desired consistency. 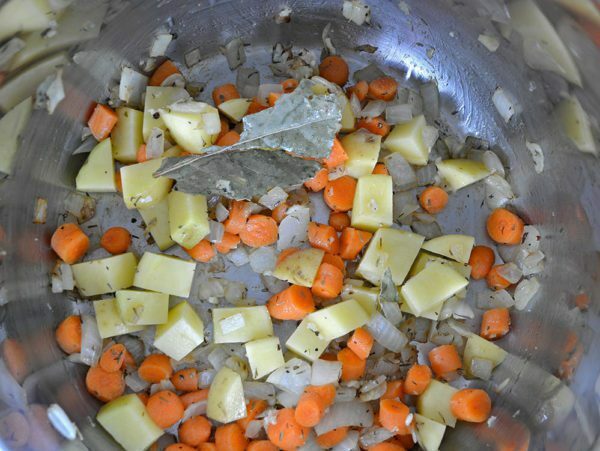 Add up to two cups of chicken broth to thin. When cooled slightly, taste and add salt as needed. Transfer to soup bowls, top with sour cream (optional) and enjoy immediately. Add the onions, potatoes, celery, bay leaves, thyme, carrots, garlic, black pepper, salt, broth and split peas to the slow cooker and stir to combine. Add the ham and cover. Cook on Low for 5-6 hours. Remove the bay leaves and any ham bones. In a large pot, add the bay leaves, broth, peas, and ham. Stir to combine. Bring to a boil and reduce heat to low. Place the lid on the pot and simmer for 1 hour. Add in the onions, potatoes, celery, carrots, pepper, garlic and thyme. Cover and simmer for 1 hour, or until the beans are soft. Optional: Add up to two cups of chicken broth once cooked, to reach desired consistency. The split peas need to be rinsed and picked through to remove any stones that may be mixed into the bag.